Our application to become a new site was accepted in 2005, and Bisti Writing Project, New Mexico, became a dot on the NWP map. We began with three core leaders—Kristine Ashworth, an elementary school teacher; Uma Krishnaswami, an author of children’s books; and myself, a college teacher. The three of us had worked together to offer satellite summer institutes in Farmington for the Four Corners Writing Project (NM). As we began our work, the support of our NWP new-site mentors and our participation in the 2006 New-Site Leadership Institute helped us understand the importance of developing teacher leadership and growing our leadership team. We brought to this event a tentative site map putting to use the talents of three others who had joined us. We had invited two teacher-fellows from earlier satellite summer institutes to intern with us during our first Bisti Writing Project summer invitational institute, and at the end of the institute we invited one of our 2005 summer fellows to join the leadership team as technology liaison. Then we were six. In February 2006, a month after returning home from NSLI, we convened a one-day leadership retreat during which we drew upon readings, resources, and strategies taken from our experience at NSLI, including the article The National Writing Project: Scaling Up and Scaling Down. Together we considered how we would “scale up” our capacity to serve teachers and schools by “scaling down” to grow strong roots. Our work together culminated in the creation of our revised site leadership map and mission statement. The new map is constructed in interlocking circles, meant to make graphic our focus on shared responsibility and to illustrate the centrality of the summer institute. Into our third year as a site, our leadership team seemed solid, and we seemed to be setting down some good roots in our community. Our writing program with teachers and students at Aztec Ruins National Monument was firmly established and our Spring Seminar series had earned a reputation as a good professional development opportunity for teachers. We had just negotiated a new contract with a local school district for an arts and writing program in three elementary schools. Then came the crash. As our summer invitational institute came to a close, three of our six key leadership team members announced that they needed to step back from the team for a variety of academic and personal reasons. In addition to wreaking havoc with the site map we had so carefully negotiated and crafted for the most recent Continued Funding Application cycle, their leaving felt like desertion; and their pulling away inspired no small amount of panic among the remaining three core leadership team members. As the dust settled, we offered our blessings to our friends and colleagues along with an invitation to return to us when they were ready. We surveyed the landscape of our site and realized as we reorganized that we had learned several lessons in this process. Our NWP new-site mentor urged us, “Be selective about whom you choose for your summer invitational institute. Take that ‘invitational’ word seriously.” We are beginning to get it. We understand more with each group how important it is to select our summer fellows carefully. Guided by the context of the local site and the NWP model, leadership team members, along with the director and co-director, collaborate in developing both a vision for the site and their own job descriptions. 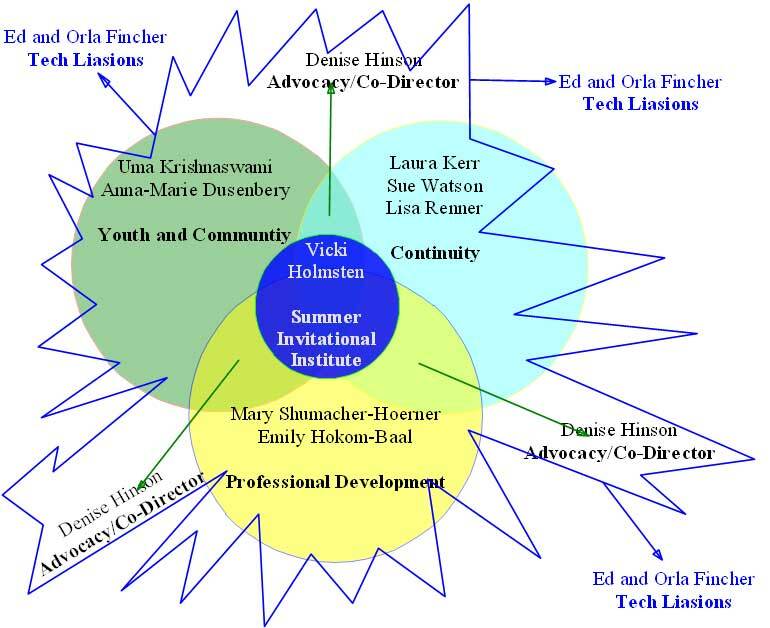 In the words of one of our departing team members, “Everyone needs an intern.” Our new site map has circles to represent the various areas of our work as a site (e.g., continuity and professional development). To assure the future of our site, the work of every site leadership team member includes building his or her own team and making sure these team members are supported and mentored as they to take on more responsibility and leadership. A site director is always looking to match site teachers with the positions that match not only their abilities but their passions. I know when we mention a project and a teacher lights up, or a teacher comes in with an idea and her eyes are on fire, then it’s my job to find a way to make this project happen. I now understand that my role is to nurture and support our teacher-leaders. I have learned, for example, that money invested in travel to send our site leaders to NWP events is money well spent: teacher-leaders find energy and inspiration as they come to understand our connection to the larger work of the NWP network. But I also understand that teachers who are drawn to writing project work are natural overachievers, marked by a reluctance to say “no” to exciting projects. Because I want our teacher-leaders to survive to take on more work for the site, I have to find ways to keep them from burning out. On our leadership team, we give each other permission to step back when work becomes overwhelming. When I see someone on the edge, I try to find gentle ways to let him know that he will do better for us all by preserving himself for the long haul. Together we negotiate ways for him to stay involved without taking on too much, and always with the invitation to return when he is ready for more. Sheridan Blau expressed this in a different way—”The most important job for a site director is to make sure the copy machine is running” (1996). I finally figured this out one cold winter morning when I realized I was emptying trash cans and looking for some AWOL coffee filters while our site teacher-leaders were presenting their sessions, facilitating small group discussions, and inviting our Saturday seminar participant teachers into the real work of a writing project site. When the leadership team is in place and functioning well, a director needs to understand when it is time to stop talking and allow the teacher-leaders to do the leading. The director offers philosophical, moral, and logistical support as an important part of the conversation, but she should not feel compelled to always be in the center of that conversation. And here’s the lesson that I learn over and over again: Life is change. My Tai Chi master says this applies to everything, and now I discover that “everything” includes the life of an NWP site. This change is often painful and difficult. But we are learning that this dark night of the soul—for people or for NWP sites—can be a period of growth and creativity. As the old circles of the Bisti Writing Project site map were vacated, we’ve had to look inside ourselves and to our teacher-leaders as we continue to negotiate and craft each revision of the map. At this writing, we have new names in all the existing circles, and we look forward to working with our new leadership team members, who are already bringing new ideas and excitement about the work of our site. We will add more names to the circles, find more ways to share the work, and plan for the future as much as is possible in this changing world. And our work will be guided by the final lesson: changes will keep happening, and we must be prepared to accommodate them.